Medellin and the surrounding region of Antioquia has a history of producing the very best Colombian cyclists. As soon as you arrive in Medellin you realise that much of this must be down to the landscape, with the city in a valley surrounded by imposing mountain ranges. On the trip to and from the airport you pass plenty of locals on their road bikes tackling the 14km climb out of the centre. I had packed my pedals, cycling shoes, bib shorts and jersey ready to spend a day of my family holiday in Medellin tackling several of the famed climbs out of the city. The only thing I was lacking was a bike. But that is not usually a problem. In most cities you can hire a road bike for a day or two and in the Alps and other similar European riding destinations there is usually a decent choice of rental shops with a choice of frame sizes and weights. Unfortunately a quick check online revealed no obvious places to rent road bikes. In Bogota you can go to Cyclotta but when I emailed them they had no clues about what to do in Medellin. I tried Colombian Bike Junkies and Medellin Bike Tour but both only rent mountain bikes - if you are looking for a mountain bike rental then both JJ (John Joseph) at CBJ and Dan Egger-Belandria at MBT were both super helpful and have high end mountain bikes for rent and also take day tours out of the city. I tried posting on the Rapha Cycling Club forum - if ever there were international travellers with expertise on renting bikes in relatively obscure places then this would be the place to find them - but no one came up with any good ideas. I tried Spinlister, often a reliable place to find bike rentals, but there were just three listings for Medellin and none of them were road bikes. It didn't help that I was looking on the weekend of the Medellin flower festival, which this year also coincided with Colombian Independence Day. This meant a lot of shops and restaurants were closed. 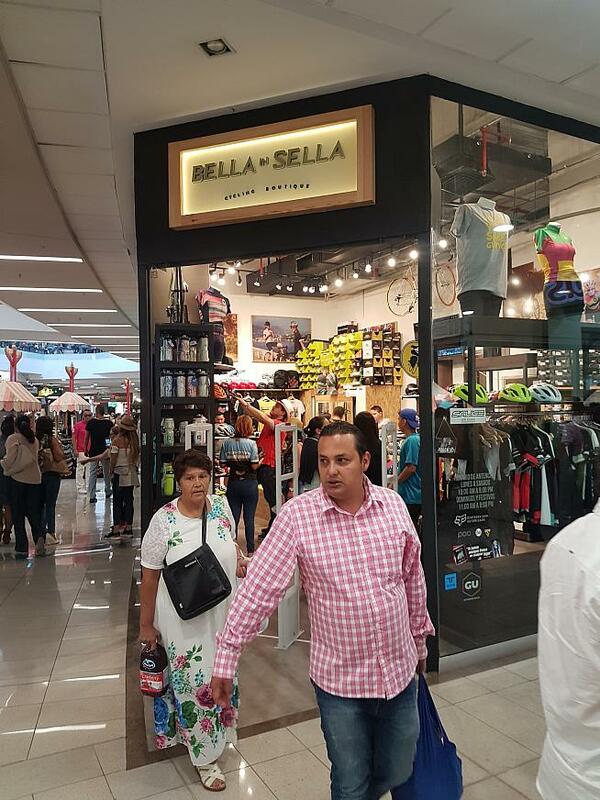 However I did find a relatively new high end cycling clothing shop called Bella in Sella, located in the Santa Fe shopping centre on the edge of Poblado. Santiago Obando, one of the co-founders of the shop, has lived in Miami and speaks perfect English and knows the Medellin cycling world inside out. He thought I would be able to rent a bike from Bicicletas Giant, one of the largest bike shops in Medellin. Bella in Sella sells the kit but doesn't rent bikes (yet!). Unfortunately Giant's shop wasn't open on Sunday. Nor was it open on Monday, although I put that down to it being a public holiday. I was on the doorstep at 9.15am on Tuesday - according to their website and the shop window they are open from 9am - but they weren't open and there were no signs of life. I went back on Wednesday lunchtime and they were open but it turns out they don't rent bikes. Lots of bikes to buy....but not to rent. So, to cut a long story short, there doesn't appear to be anywhere in Medellin that rents road bikes. Which is a massive shame for a city of more than three million people that is increasingly becoming a touristic destination. If anyone is reading this and does know of somewhere that rents road bikes in Medellin - or if you are thinking of starting a rental business - then do let me know via our feedback form and we will add your details to this article. 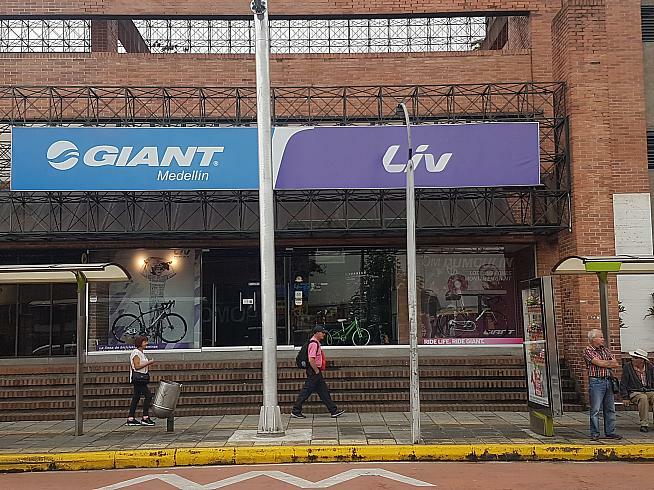 Read Sportive.com's guide to Medellin bike shops.